Thanks to a special grant, each graduating 2015 student and all teachers in both our middle school and the elementary school received a Lucky Iron Fish in August 2015. 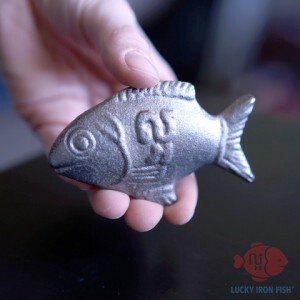 By placing this small iron fish in a cooking pot or boiling water, a family can obtain the necessary iron to overcome iron deficiencies and anemia. 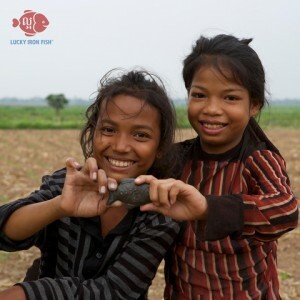 Do you want to help buy more Lucky Iron Fish for our students? Please click here. In March 2015 Cambridge pediatrician and Cambcamb Board member, Dr. Lisa Dobberteen, visited our school and taught the students and teachers about relevant public health issues, including AIDS education, healthy eating, the importance of hand washing, the value of physical exercise, and of getting plenty of sleep. The students were also interested in topics related to all aspects of science, including medicine, space and computers. Dr Dobberteen was joined by her daughter Abby, who was working in Cambodian medical clinics and schools with the Peace Corps, and is fluent in Khmer. They were impressed by the students’ warm welcome and enthusiasm for learning! Our teachers are now able to share this information with other classes in the future. Thank you, Lisa and Abby! Our teachers are now prepared to discuss the AIDS epidemic and rampant human trafficking issue in Cambodia with our students and their families. Educating both girls and boys about this problem is considered a successful grass roots effort to combat these enormous issues. Cambodia has the fastest growing AIDS epidemic in Southeast Asia, in large part due to human trafficking.